It’s a blockchain governance minimization law that can be referred to whenever disputes affecting protocol improvement is concerned. As we know, Bitcoin Cash is a product of a protocol change. There was a divergence on the best way of scaling Bitcoin legacy. Behind all this disagreement was block size increment. Dubbed Segwit 2x, Bitcoin was supposed to increase its block size to 2MB. However, it was changed in the last minute with the business community–including payment processors as BitPay withdrawing in the last minute. 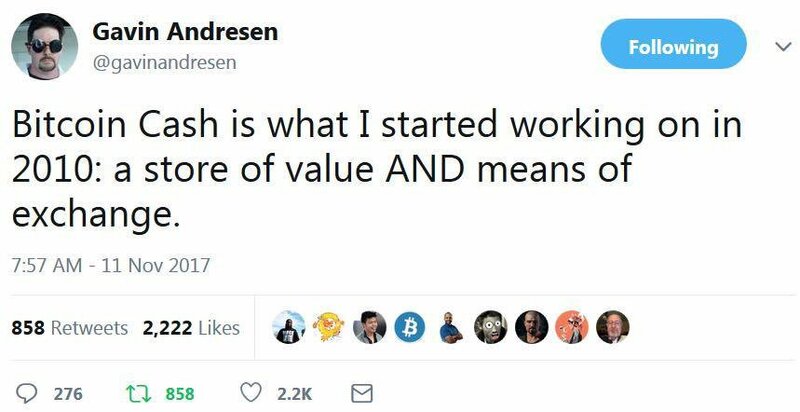 The result of that was a hard fork and the birth of Bitcoin Cash whom Gavin Andersen and Roger Ver claim is the real Bitcoin. A community has formed around it and five hard forks later, BCH is derelict, a wallowing shadow of its former self trading at $120. That’s 98 percent from 2017 peaks. Roger Ver now says “the block size limit will go down in history as one of the worst things to ever happen to Bitcoin.” But not everyone agrees. Regardless, there is a glimmer of hope as far as BCH trading is concerned. The coin is one of the top performers in the last day adding a 3.2 percent at the time of writing. This is positive and as long as prices are trending above the psychological $100 mark, odds are prices will inch higher in coming days as our BCH/USD trade plan conditions are validated. So far, BCH/USD is ranging within a tight $30 zone with clear supports at $105 and resistance at $135. 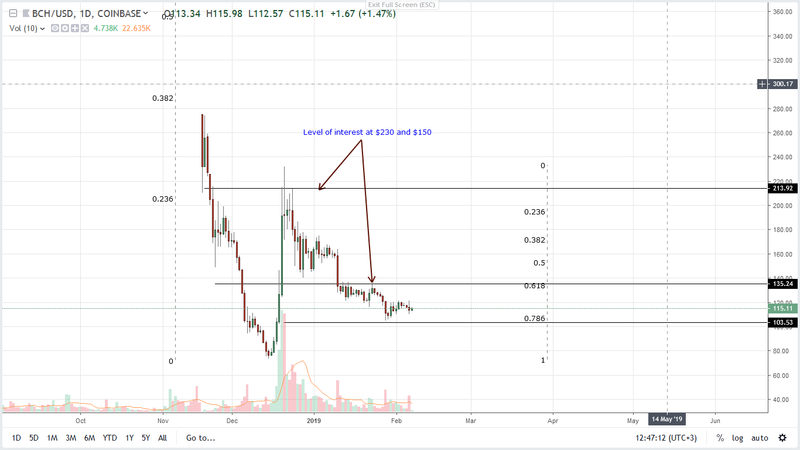 We may be positive on short-term BCH prospects by prices are actually bearish from a top-down approach if we analyze price action from the weekly or monthly charts. However, after the initial break from $400 where BCH dropped to lows of $70, prices are recovering in a re-test phase. Often times during the retest phase, prices tend to snap back to previous supports now resistance. In our case that is $400 and already there are hints of that happening. This recovery is the short-term bullish phase of which price action is stuck at. Before we recommend longs, BCH bulls must first race above $135 in a minor breakout pattern confirming the three-bar-bull reversal pattern of Jan 28-30 complete with high trade volumes. Thereafter, risk-off traders can load on pull backs with first targets at $230 or Dec 2018 highs. Jan 28’s bear bar had high volumes—62k against 23k. For buyers to be in charge, there must be a breakout above $135. The resultant bar will not only reverse Jan 28 losses but the bar should be marked by high trade volumes exceeding 42k or Feb 5 and preferably Jan 28’s 62k. Such a spike will reveal underlying demand and possible resumption of mid-Dec 2018 buyers.